[S709] Diocese of Antigonish, Nova Scotia, Canada , Baptismal record of Ann Cameron, page 242. [S709] Diocese of Antigonish, Nova Scotia, Canada , Baptismal record of Lauchlin Cameron, page 261. Year: 1881; Census Place: Upper South River, Antigonish, Nova Scotia; Roll: C_13176; Page: 2; Family No: 9. [S709] Diocese of Antigonish, Nova Scotia, Canada , Baptismal record of Christine Cameron, page 249. [S100] Obituaries from The Casket Newspaper, 1852 - present, The obituary of Duncan Cameron, 72-1924-5-8. [S100] Obituaries from The Casket Newspaper, 1852 - present, Obituary of Duncan Cameron, issue # 72-1924-5-8. [S709] Diocese of Antigonish, Nova Scotia, Canada , Marriage record of Alexander McDonald & Catherine Cameron, page 485. [S709] Diocese of Antigonish, Nova Scotia, Canada , Baptismal record of Angus McDonald, page 488. [S709] Diocese of Antigonish, Nova Scotia, Canada , Baptismal record of Alexander Cameron, page 189. [S709] Diocese of Antigonish, Nova Scotia, Canada , Baptismal record of Catherine Ann Cameron, page 206. [S709] Diocese of Antigonish, Nova Scotia, Canada , Baptismal record of Angus Cameron, page 207. [S709] Diocese of Antigonish, Nova Scotia, Canada , Baptismal record of Sarah Cameron, page 207. [S709] Diocese of Antigonish, Nova Scotia, Canada , Baptismal record of Lauchlin Hugh Cameron, page 208. [S709] Diocese of Antigonish, Nova Scotia, Canada , Baptismal record of Hugh Cameron, page 209. [S709] Diocese of Antigonish, Nova Scotia, Canada , Baptismal record of Donald Cameron, page 209. Married Name: As of circa 1840,her married name was Cameron. [S1089] 1871 Federal Canadian Census, on-line, Original data: Library and Archives Canada. Census of Canada, 1871. Ottawa, Ontario, Canada: Library and Archives Canada, n.d.. RG31-C-1. Statistics Canada Fonds. Microfilm reels: C-9888 to C-9975, C-9977 to C-10097, C-10344 to C-10388, C-10390 to C-10395. [S709] Diocese of Antigonish, Nova Scotia, Canada , Baptismal record of Allan Cameron, page 193. [S709] Diocese of Antigonish, Nova Scotia, Canada , Baptismal record of Catharinan Cameron, page 245. [S709] Diocese of Antigonish, Nova Scotia, Canada , Baptismal record of Colin Cameron, page 251. [S709] Diocese of Antigonish, Nova Scotia, Canada , Baptismal record of Isabel Cameron, page 254. [S709] Diocese of Antigonish, Nova Scotia, Canada , Baptismal record of Janet Cameron, page 255. [S709] Diocese of Antigonish, Nova Scotia, Canada , Baptismal record of William Cameron, page 264. 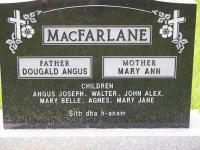 [S861] Ancestry.com, online www.ancestry.com, 0861 - 3642 - Angus William Gillis.docx. 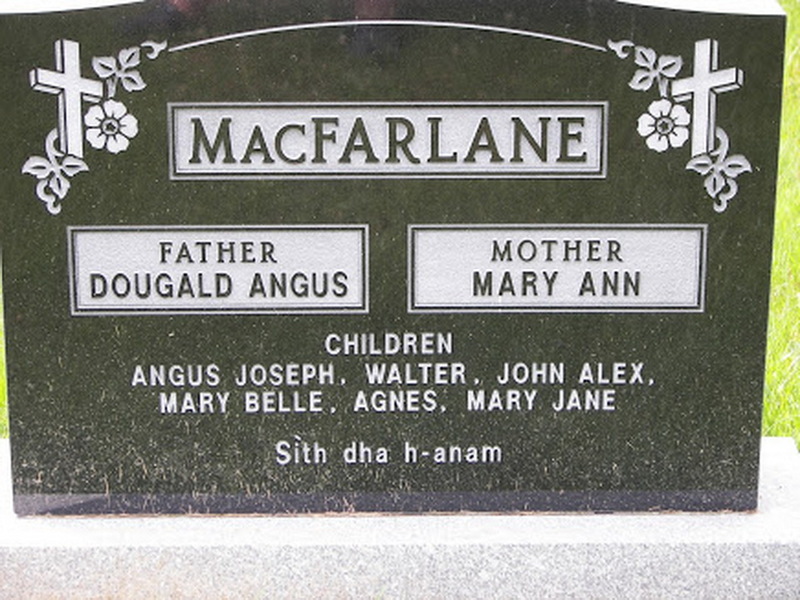 Language*: Catherine MacLellan spoke Scotch Gaelic. Language*: Mary Catherine Gillis spoke Scotch Gaelic. Language*: Katie Agnes MacFarlane spoke Scotch Gaelic. Language*: Peter Coady spoke English. Language*: Andrew Coady spoke English.